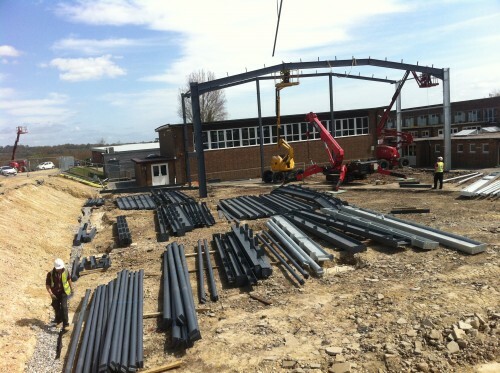 Back in March 2013, Robertsbridge Community College, East Sussex required a brand new steel framed sports hall to keep up with the demands from their busy centre. Not only did they need a 4 court sports hall built to Sport England standards, they also needed it to be fully functional with a kitchen, classrooms, WC’s and office space. The Steel portal frame building was 10,000 sq.ft sports hall and the building also comprised of 6,000 sq.ft of classrooms, office space, Part M WCs and a kitchen. Over a period of 26 weeks, not including a 4 week break for exams, the project was completed on time and to budget. 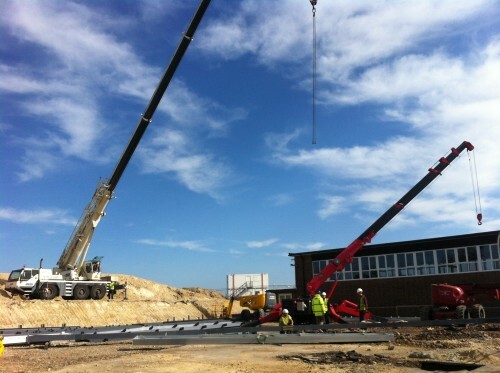 As the school was open throughout the build period, health and safety was a huge priority throughout, as well as trying to consider delivery methods to avoid as much disruption as possible to the education of the pupils.